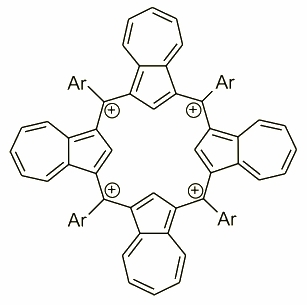 Azulene was involved into the porphyrin skeleton by N. Sprutta eventually creating a big family of carbaporphyrins. The idea of employing azulene to porphyrins were based on the special properties of this surprising molecule. Azulene is a special carbocycle where the five membered ring behaves similarly to heterocycles and both a-positions are highly reactive towards electrophilic substitution. On the other hand the presence of heptatriene motif in the skeleton allows a formation of stable cations that have stimulated a broad interest in these, colourful compounds. Based on the experience gathered in our group the first attempt was a reaction of the azulene and 2,5-derivatized furan and thiophene. The molecules obtained in an acid catalyzed reactions followed by a DDQ oxidation gave two, structurally similar compounds where two azulenes and thiophenes/furans were built-in. Both macrocycles are not aromatic as the full delocalization is blocked by a carbocycle moiety. Further oxidation of these molecules gave other compounds with spectroscopic features typical for aromatic species as the delocalization was possible. The 1H NMR spectrum has shown the aromatic character and the electronic spectrum possesses far red shifted absorbance as a proof of the presence of two cations in the molecule. The UV-Vis spectrum of the diazuli-dithiaporphyrin showed absorbance at 1320 nm. Azulene can also be treated as a source of subunit able to form a quatyrin analogue - a fully carbonificated porphyrin with all four nitrogens replaced by carbons. It has been achieved by an acid catalyzed condensation of azulene and proper arylaldehyde. The compound obtained on that way was isolated as a tetraazuleneporphyrinogen where four meso position remain unoxidized. The oxidation were performed in a moisture free conditions with DDQ/HBF4 mediation eventually giving a tetracation tetraazuliporphyrin. The tetracationic character locates this molecule in a row of highly charged macrocyclic receptors and a potential subunit of electronic materials. Sprutta, N.; Świderska, M.; Latos-Grażyński, L. Dithiadiazuliporphyrin: Facile Generation of Carbaporphyrinoid Cation Radical and Dication J. Am. Chem. Soc. 2005, 127, 13108. 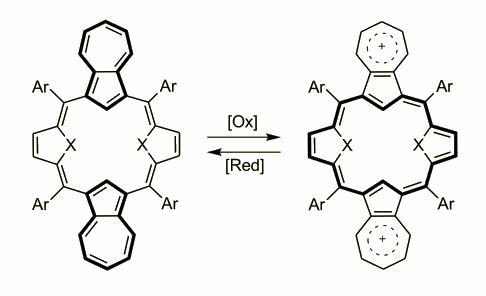 Sprutta, N.; Siczek, M.; Latos-Grażyński, L.; Pawlicki, M.; Szterenberg, L.; Lis, T.Dioxadiazuliporphyrin: A Near-IR Redox Switchable Chromophore J. Org. Chem. 2007, 72, 9501. Sprutta, N.; Maćkowiak, S.; Kocik, M.; Szterenberg, L.; Lis, T.; Latos-Grażyński, L. Tetraazuliporphyrin Tetracation Angew. Chem. Int. Ed. 2009, 48, 3337. Sprutta, N.; Wełnic, M.; Białek, M. J.; Lis, T.; Szterenberg, L.; Latos-Grażyński, L. Carbocations confined in a thiatriazuliporphyrin frame. Chem. Eur. J. 2016, 22, 6974.